Teach your children about the calendar -- days of the week, months of the year, holidays, and seasons -- with these easy teaching ideas. What Does a Calendar Study Include? Understanding the calendar is not only a skill in the language arts curriculum but is also a necessary life skill. Fortunately it is a tool that we use almost daily, so there are plenty of opportunities for practice, even with small children. When you are teaching your children about the calendar, here are things to include. There are three main options for teaching the calendar to your children. I've outlined them below. 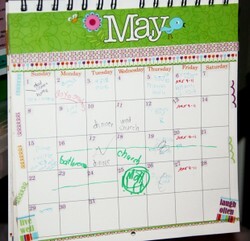 My top choice for teaching the calendar to children is to have them make their own personalized calendars. This is the way I taught my daughter about the calendar many years ago. Let the children write in the year, the month, the days of the week, the dates, and important events. When they write these details themselves rather than their being pre-printed on, the childred have more pracice with the new words, how they are spelled, and the order in which they always come. The making is part of the learning. For this project you can either print off blank templates or use a store bought kit like the one featured below. HINT: If using a blank template, go to a copy store and enlarge it onto 11x17" (A3) paper. Young learners are going to struggle with writing long days like "Wednesday" and "Saturday" into tiny slots at the top of a calendar. Make sure to reference your calendar at least a few times a week if not daily. That will give your child repeated practice with using a calendar and its vocabulary. What day will tomorrow be? Yesterday? What will the date be in one full week? Do we have anything special planned for today? Are there any holidays in this month? What day will that be? 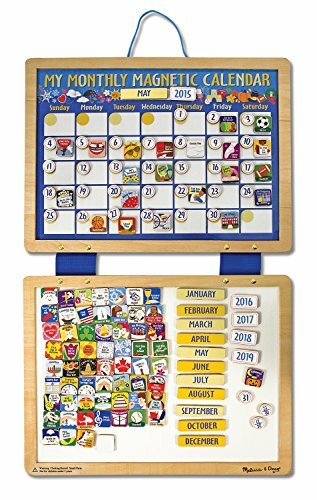 This calendar has room for coloring and decorating the top half and stickers for marking special days on the grid at the bottom. 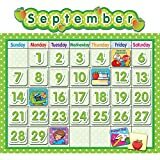 The days of the week are already printed onto this calendar, but daily review will help children to memorize the names and order of the days of the week and months of the year. Three versions here of totally blank calendar grids. You fill it in yourself. Look for the blank calendars at the bottom of the list. There is a weekly and a monthly version. Loads of templates, including pages that include blank portions for a drawing. For moms who like a classier appearance, a fancy calendar kit may be a good option. This beautiful wooden set by Melissa and Doug is high quality and will last years and years of homeschooling. Each month, just move the magnetic pieces around to set up the calendar. To teach your children about the calendar, be sure to reference it each day, asking the questions listed above. Enlist the children's help with setting up the calendar for a new month. Getting them involved will help them to remember. This gorgeous magnetic set includes all you need for a customizable monthly calendar. When the month is over, simply rearrange the magnets for the new month. Cute holiday and event magnets are included in this set too. For a less expensive option, try one of these bulletin board sets. For increased durability and longest use, laminate the pieces. Otherwise, you may find it hard to remove the dates from the calendar. Teach about the calendar in the same method as with the other types of calendars -- ask questions about today and other days of the month. Discuss events on the calendar that are important to the children such as field trips, birthdays, holidays, and outings. Loads of free, full-color printables for creating your own wall calendar or learning aids. It's summer, but if you're still learning, Father's Day makes a great unit study topic. Honor Dad with these homeschool lesson plans and printables. Hummingbirds can be enticed to come very close to your house where you can observe them for nature study.